The challenge - how to fit three twin-size matresses in a compact space without making everyone feel like sardines. The answer - a new angle on a triple bunk. I've seen a few commercial triple bunks. All stacked the beds one atop another in three layers. This is ok if you have the headroom but for most of us, the results would be like sleeping in a submarine. My wife came up with a compromise bunk bed where the first and third (top-most and bottom-most) beds are rotated 90 degrees to form a right angle with respect to the middle bunk. This alignment sacrifices some floor space but in return, it provides greater headroom for the occupants. 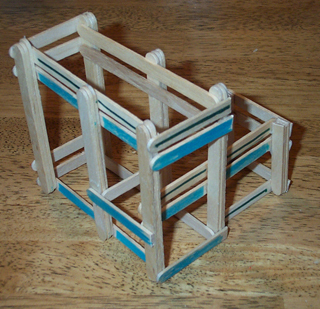 The first step in the design process was to build a model of the entire unit. 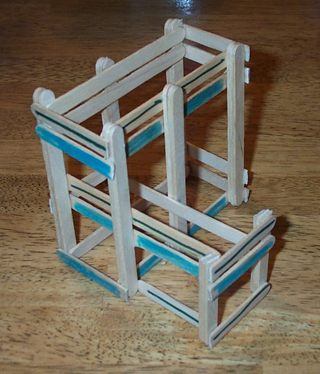 Above are four views of the popsicle stick mock-up. 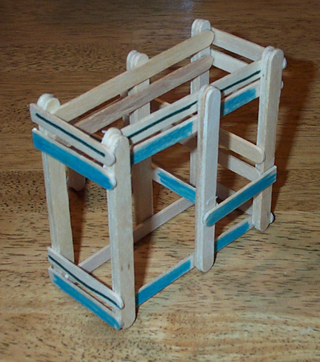 Full blue colored sticks are 1x6 beams; partially blue colored sticks are 1x4. The posts are 4x4. Notice that the lowest bunk is very close to the floor to maximize useable headroom. In this arrangement, the two lower bunks have the benefit of added headroom (over a conventional triple-stacked bunk bed) while sacrificing foot-room (assuming you sleep as intended in the space). 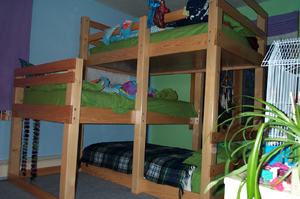 The top bunk is lower than a conventional triple bunk so it too gets more headroom. 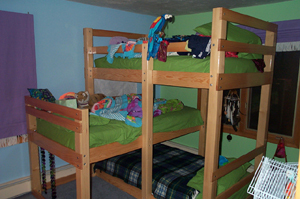 The final triple bunk differs slightly from the model in the placement of the top bunk railings. These two pictures show the completed bed. Construction is extremely simple - everything is made from douglas fir and bolted into place at half-lapped joints. Nuts are recessed in countersunk holes. The difficult part is marking all the cuts in the right places before making the very first cut. Once all the pieces are milled, they are sanded and urethaned. 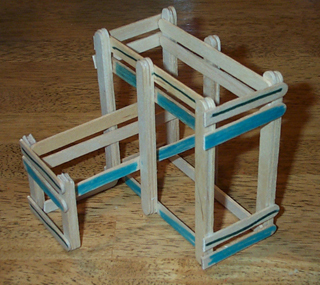 Cleats run along the edges of each level to support a piece of plywood which in turn supports the mattress. Part of the top bunk railing has since been cut off to make it easier to climb to the top via the middle bunk. The final results worked surprisingly well. The bolted design is extremely strong, yet inexpensive. Best of all, everyone enjoys climbing in and out of the beds! I received some email recently asking for more measurements of the bed. Here's some additional info. Hopefully it's enough to help those who are interested in making a similar piece. Each bed layer consists of a 1x6 (3/4 x 5.5) piece of douglas fir on all four sides. On the inside of this rectangle are a set of (roughly) 1x1 cleats (actual size is not all that important). The cleats are glued and screwed on the inside bottom of the 1x6 railing. A piece of 3/4 inch plywood sits on these cleats and supports the mattress. The plywood is 39.5 x 76. We used furniture grade plywood and urethaned both side to avoid splinters. Mattress size is "twin". What the above gives you is a railing that extends about 3.5+ inches above the plywood. Your mattress will extend above the top edge of the railing. The bottom-most bed is almost directly on the ground. I think we left a little gap at the bottom just in case the floor wasn't flat. Of course that also invited "stuff" (papers ?) from getting lost under the bed. On carpeting it's not as big a deal. The middle bed is placed such that the bottom of the rail is 27 inches above the ground. The top bed has its rail bottom 54 inches from the bottom. Remember that these measurements are taken from the bottom of the rail. The ceiling in the room is 91 inches high. You can make adjustments to suit your needs. We didn't simply divide the height into 3 because the bottom 2 beds have the effective headroom of 2 bed spaces. The taller bed posts are 80 inches tall. This gives enough extension above the top mattress for safety. One post was later cut down to make getting in and out easier; you can play with that as you see fit. The 2 short posts that are only used by the middle bed are 48 inches. You'll want to adjust these heights if you make changes to the basic partitioning of the space. If you look at the pictures, you'll note that the horizontal rails are rabbetted into the vertical posts. Getting these just right is the most difficult part of the project. My memory fails me here but I believe every post is different and most have rabbets cut on two adjacent sides. You can avoid this headache by surface mounting the rails. Not only do you save the time and care needed to cut the rabbets but you can actually assemble the bed as you mill your stock - build to fit. Of course you may want to apply the finish to each piece seperately (disassembled).